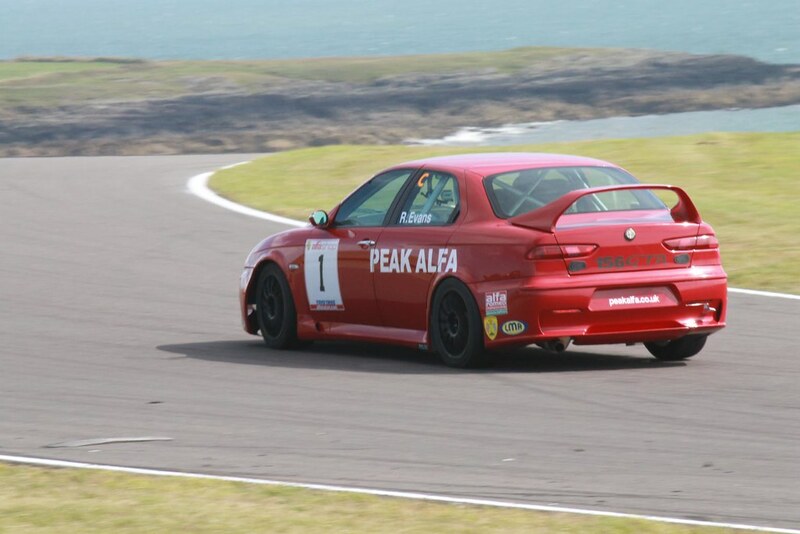 The Alfa Romeo Championship will be making a welcome return to the picturesque and challenging Anglesey Coastal circuit this year after a 4 year absence. 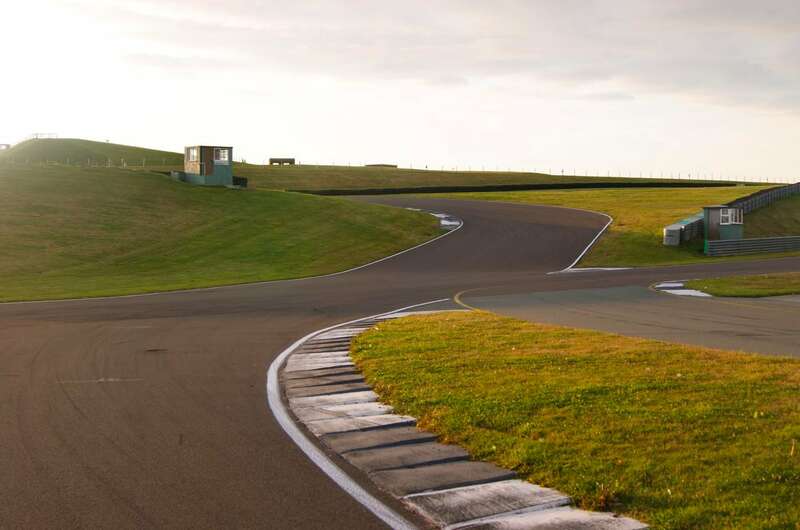 The name of the circuit configuration we will be using, ‘Anglesey Coastal’ is very appropriate: when drivers emerge from the tight series of bends at the top of the hill they are faced with a breathtaking view of the Irish Sea on the south side of the island with the mountains of Snowdonia as a backdrop. Pausing to admire the view is not an option, however, as you are about to descend steeply through a series of tricky ‘S’ bends, aptly named the Corkscrew, with your right foot impatient to get on the power again at the bottom as you exit onto the start/finish straight. Only 3 of this year’s entrants took part in the last race weekend here in August 2014: 2016 champion Tom Hill, who made his debut at Anglesey that weekend in the Alfa Romeo championship, double champion Roger Evans, and Kristian Leith who has returned to the championship after a 4 year break. Circuit knowledge is undoubtedly an advantage and anyone who is able to test on Friday will certainly benefit. It is very encouraging that we have an entry of 17 cars. Anglesey is a very long journey for nearly everyone and historically grid numbers haven’t been as strong there as for most other circuits. For those having to go to work on the Friday before and the Monday after the meeting it is a demanding schedule, but at least this time we will have finished our second race by Sunday lunchtime, which will help those with a long journey home to get there at a reasonable hour. 11 of the 17 entries are in the Twin Spark cup. Class leader Tom Hill will be looking to repeat his dominance at Silverstone in his Bianco Auto Developments black and gold 156. Tom will be keen to strengthen his position in the class this weekend and to extend his challenge for the overall leader board. 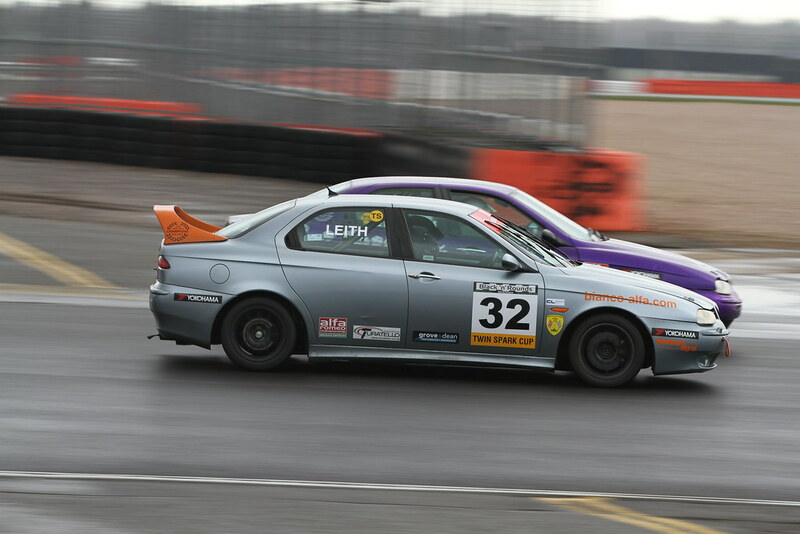 A number of very competent and competitive drivers will be doing their level best to challenge him including previous race winner Simon Cresswell, back on the grid in his orange 156 after having to miss the opening race weekend. Dave Messenger, always competing for top positions in his tricolor liveried Darnells Engineering 156, will be hoping that the electrical gremlin that spoiled his second race at Silverstone has been banished. Previous overall Champion Paul Plant, making one of his occasional appearances in addition to his Bianco duties, will be ensuring anyone who beats him will know for sure that they have been in a race! Josh Lambert and Mike Tydeman in their Bianco supported 147 and 156 respectively and Richard Ford in his Hitek Electronic Materials 156 will also be looking to compete in the leading group after strong performances at Silverstone, and Josh in particular will be hoping for better luck also. Riccardo Losselli in his green 147 and Cip Nistorica in his Turatello Trailers 156 are newcomers to the Alfa Romeo championship and both showed improving performances at the opening rounds as did Shetland Islands driver Kristian Leith in his 156. Making his debut in the Championship this weekend is Kevin Gallagher in a 156 Twin Spark he has developed himself with some assistance from Paul Plant. A warm welcome to Kevin – we hope he enjoys the weekend and that this will be the first of many outings in our Championship. In the Power Trophy class we again have an encouraging entry list of 5 cars. 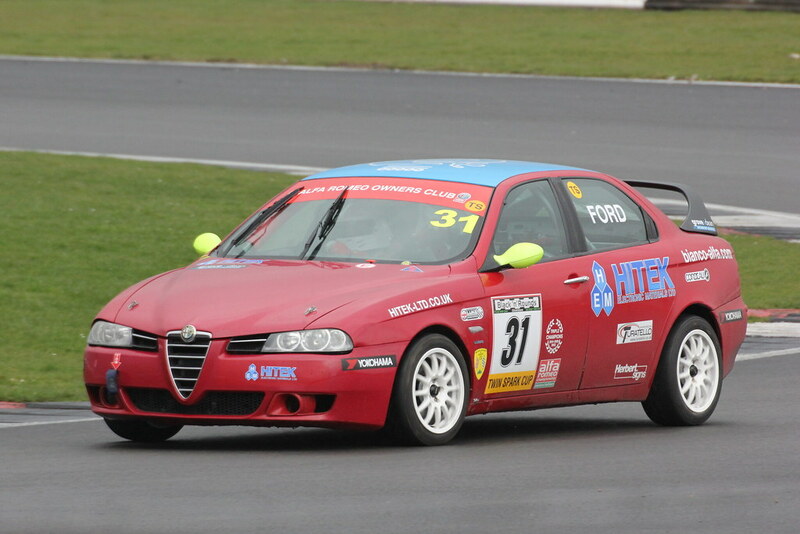 Double Champion Roger Evans has built a brand new red Peak Alfa 156 GTA which he has entered, just back from its rolling road test. If it goes as well as it looks then it will certainly be strong competition for Paul Webster, who won both races at Silverstone. Paul has been driving extremely well and leads the Championship table after the first 2 rounds, having taken 2 outright victories. The rapid and nimble Abarth Fiat Puntos of the McFie brothers Chris and Simon are sure to be very competitive, and particularly so around the twisty parts of the circuit. Chris will be hoping for much better luck than he had at Silverstone when strong showings came to nought with a sheared wheel bolt in qualifying, a broken throttle cable in Race 1 and lost drive in Race 2. Let’s hope that experience will have used up his quota of bad luck for the season! Simon was prominent at Silverstone with two good results and will be hoping for a repeat. 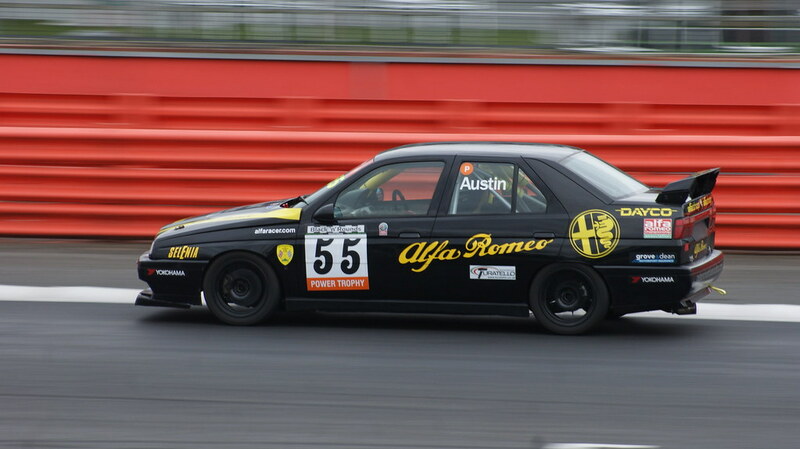 Finally it will be a great pleasure to see Scott Austin again in his black 155. Scott acknowledged that it was ‘work in progress’ for both himself and the car at Silverstone and his determination and perseverance in developing and improving both is sure to reap dividends in due course. Some entrants have not competed at Anglesey before and most others have not done so for some years, so this should make for some interesting and close racing. The challenging aspect, gradients and corners of this unique Anglesey venue will make it an absorbing contest. Most of all we hope that everyone concerned enjoys an excellent weekend’s racing in fine weather with cars and drivers alike in great shape at the conclusion of proceedings.